Informal gold mining is one of the main sources of mercury contamination. An artisanal gold miner in El Corpus, Choluteca along the Pacific ocean in Honduras. Credit: Thelma Mejía/IPS. ROME, Aug 16 2017 (IPS) - The Minamata Convention — a legally-binding landmark treaty, described as the first new environmental agreement in over a decade – entered into force August 16. 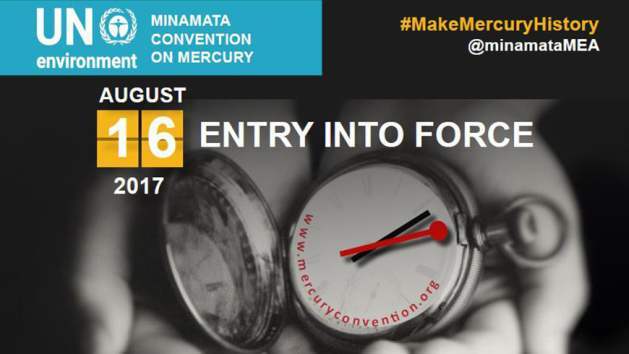 The primary aim of the Convention is “to protect human health and the environment” from mercury releases, which are considered both environmental and health hazards, according to the United Nations. So far, the international treaty has been signed by 128 of the 193 UN member states and ratified by 74 countries, which are now legally obliged to comply with its provisions. The Zero Mercury Working Group (ZMWG), an international coalition of over 95 public interest non-governmental organizations (NGOs) from more than 50 countries, has been calling for a legally binding treaty for over a decade and “welcomes the new protocol”. The treaty holds critical obligations for all 74 State Parties to ban new primary mercury mines while phasing out existing ones and also includes a ban on many common products and processes using mercury, measures to control releases, and a requirement for national plans to reduce mercury in artisanal and small-scale gold mining. According to ZMWG, mercury is a global pollutant that travels long distances. Its most toxic form – methylmercury – accumulates in large predatory fish and is taken up in bodies through eating fish, with the worst impacts on babies in utero and small children. In an interview with IPS, Michael Bender and Elena Lymberidi-Settimo, Co-coordinators of ZMWG said despite its flaws, the new treaty presents the best opportunity to address the global mercury crisis. ‘’The ZMWG looks forward to effective treaty implementation and providing support, where feasible, particularly to developing countries and countries with economies in transition”. Q: What would be the significant impact of the Minamata Convention entering into legal force on August 16? How will it advance the longstanding global campaign to end the widespread use of mercury which has long been declared both an environmental and health hazard worldwide? A: The new treaty is a mixture of mandatory and voluntary elements intended to control the burgeoning global mercury crisis. It holds critical obligations that affect global use, trade, emissions and disposal of mercury. In the near term, such provisions include a prohibition on any new primary mining of mercury, and phasing out mercury added products (by 2020) and mercury bearing processes (by 2025). Support for treaty implementation will be provided through a financial mechanism established in the Convention text. Furthermore, the treaty includes reporting provisions (also relevant to the question below) which entails the Convention Secretariat monitoring progress and, over time, having the Conference of the Parties address issues that may arise. The treaty also includes other provisions which provide information and guidance necessary to reduce major sources of emissions and releases. Taken together, these steps will eventually lead to significant global mercury reductions. However, while heading in the right direction, the treaty does not move far enough nor fast enough in the short run to address the spiraling human health risks from mercury exposure. In the case of major emission sources, like coal-fired power plants, the requirements are for countries to follow BAT/BEP practices (best available technologies/best environmental practices) to curtail releases, but no numerical reduction targets were established. New facilities will not be required to have mercury pollution controls for 5 years after the treaty enters into force, with existing facilities given 10 years before they begin their control efforts. The treaty also addresses artisanal and small-scale gold mining (ASGM), which is both the largest intentional use and emission source of mercury globally. However, while required ASGM national action plans (NAPs) will foster reduced use, the treaty fails to include a provision to require an eventual end to mercury use. It is envisioned, however, that NAPs will eliminate many of the worst practices that constitute the vast majority of mercury use in the sector. While the Convention bans new primary mercury mining, it allows existing primary mining for 15 years (but does not allow supplying such uses as ASGM.) From this source, mercury is only allowed in the manufacturing of mercury-added products and other manufacturing processes. Q: What in your opinion are the key provisions of the Convention that could eventually lead to a worldwide ban on the use of mercury? A: The Convention contains control measures aimed at significantly limiting the global supply of mercury to complement and reinforce the demand reduction control measures. Specifically, the Article 3 provisions limit the sources of mercury available for use and trade, and specify procedures to follow where such trade is allowed. Eventually, as mercury uses diminish, via the different Convention provisions – (e.g. the Convention’s 2020 mercury-added product phase out, and 2025 ban on the mercury use in the chlorine production)– the production and exports from primary mercury mines will be reduced. As discussed above, while the Convention does not ban its use, the provision to develop plans for curtailing mercury use in artisanal and small scale gold mining is important, since it is the largest mercury use and release sector, far surpassing emissions from coal fired power plants. Q: With 74 ratifications so far, is there any mechanism that will help monitor the implementation of the convention by the 74 countries that are state parties and who are legally obliged to comply with the provisions of the convention? Does the convention lay out any penalties against those who violate the convention or fail to implement its provisions? A: The Convention establishes reporting requirements by the Parties, including reporting on “measures it has taken to implement provisions of the Convention and on the effectiveness of such measures…” Further, no later than six years after the Convention enters into force, the Conference of the Parties (COP) is charged with evaluating the effectiveness of the Convention The evaluation shall be based on available reports and monitoring information, reports submitted pursuant and information and recommendations provided the Implementation and compliance committee. This is why discussions during COP1 (scheduled to take place in Geneva September 24-29) regarding reporting forms are so important. The Article 21 reporting requirements will provide critical information on the global mercury situation and the effectiveness of the Convention in achieving mercury reductions and protecting human health. Information Parties report on should be made publicly available. This should include information on emissions and releases; the quantities of waste mercury (i.e., commodity-grade mercury no longer used) that was disposed, and the method of final disposal; and the decisions on frequency of reporting. Most importantly (at least for mercury production and trade) we recommend the data be provided annually in order to accurately monitor the changing global circumstances, and because of the problems with other data sources. The NGOs will also play the watchdog role in monitoring progress, and ‘naming and shaming’ as relevant, as we follow the process in the COPs, etc. Q: Are there any concerns that some of the leading countries, including UK, Russia, Germany, India, Italy, South Africa, Australia and Spain are not on the list of ratifiers of the convention? Have they given any indications of future ratifications? As far as South Africa, our partner NGO, Ground Work, has stated that ratification remains a challenge in South Africa because the industrial sector is very heavily driven by the coal industry, with almost 90% of the energy from coal. The large-scale mining sector is also not willing to declare the amount of mercury released from the ore that they mine. All EU countries will eventually all ratify. India has started the process toward ratification, as has Australia and also Russia- but it may take some time. In the meantime, India has taken some affirmative steps in shifting out of mercury-cell chlor-alkali plants and regulating mercury. However, emissions from thermal power plants is still a concern since almost 60 % of the energy generated is from coal and the cost associated with capturing mercury from coal emissions is viewed as a constrain.